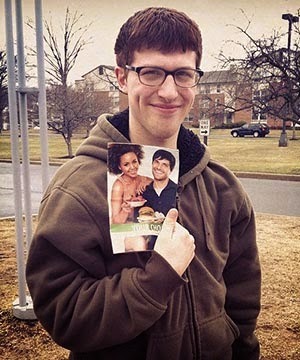 VO Outreach Coordinator Chris Guinn has traveled to 90 different campuses this semester, directly handing Vegan Outreach booklets to over 45,000 students! Since the fall of 2013, Chris has reached more than 102,000 individuals! 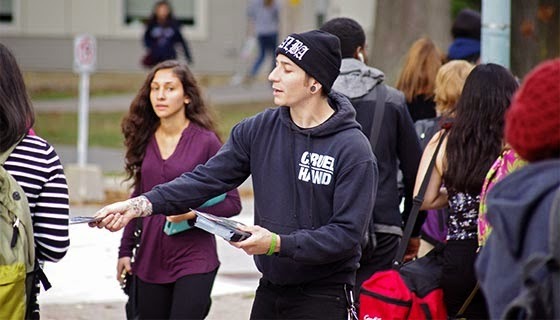 Alex Greenwood snapped this pic of Chris handing out Even If You Like Meat at the U of Toronto in Mississauga. 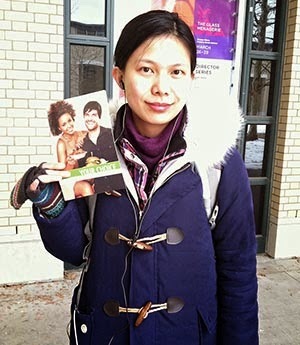 “CMU is definitely a favorite for me; the main walkways are almost always busy. Matt and I had help from all-star volunteers Linda and Dally, who joined us as first-time leafleters. They each did an amazing job and spent 2 hours in the cold with us – pretty awesome of them! They also told me that they'd talked to a good number of vegetarians and vegans! Linda and Dally make their leafleting debuts at CMU. Iris wants to go veg after reading Your Choice. Jonathan went veg after getting a booklet last year. “What an amazing day at Rider University! Matt and I were able to reach 564 students before we had to take off; but even still, we hit a good majority of the students there today. “I had a truly heartwarming experience this afternoon with a student named Jonathan. As soon as I saw him, I remembered him from my visit to Rider last semester, and he quickly recognized me as well. Last semester we had a great conversation about vegetarian eating, and Jonathan, who was then a meat eater, was excited to share that he is now a vegetarian! You can help Vegan Outreach continue to change hearts and minds, one leaflet at a time, by checking out Chris’s Team Vegan page here.